From a squalid New York drug den to the spectral ruins of Sarkomand . . .
From the horrors of the Underworld to the zoog-haunted Enchanted Wood . . .
From the twilight city of Inquanok to the endless sunset of Ilek-Vad . . .
All the wonders of dream await—and all the terrors of nightmare, too. 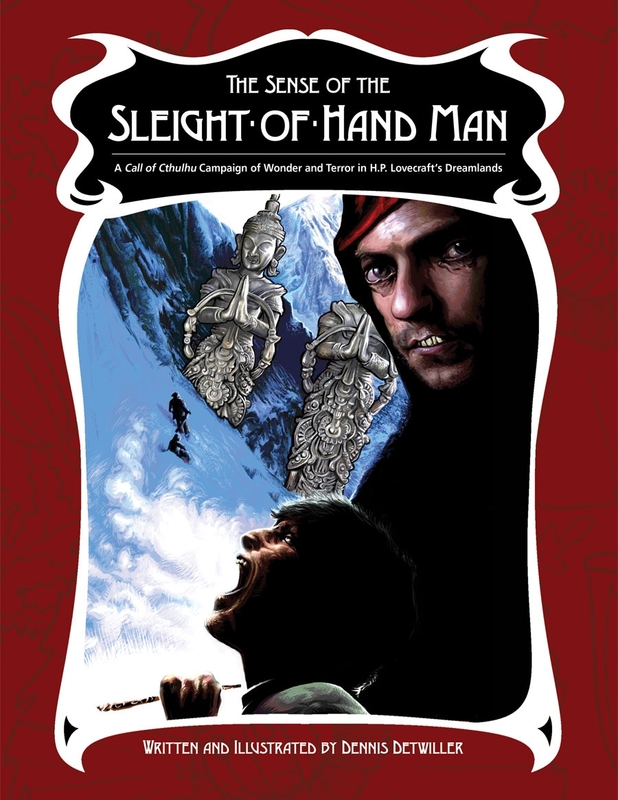 The Sense of the Sleight-of-Hand Man is a full-length Call of Cthulhu (Sixth Edition) campaign of adventure, cosmic mystery, and deepest fear set in the Dreamlands of H.P. Lovecraft. The player characters—the Dreamers—explore the breadth of the otherworldly Dreamlands seeking a way back to the lives that they left behind. But can they survive the countless dangers of a world of dream—and the strange emnity of Nyarlathotep, the messenger and soul of the Outer Gods, when they fall under his capricious gaze? It took the RPPR crew 7 sessions of play to complete the campaign, but we did not visit every area described in the book. Episode 1: a group of opium addicts are thrown into the Dreamlands and realize they must journey far and wide if they are to return to the real world. Episode 2: The dreamers reach the city of Inquanok only to find they must quest far from the safety of its walls if they are to proceed. Episode 3: The ocean holds its own dangers, notably pirates. Infiltrating an island stronghold is easier said than done. Episode 4: Even the relative safety of the city of Lhosk is illusionary. The Men from Leng lurk in its shadows waiting to ambush to the dreamers. Episode 5: The underworld of the Dreamlands stretches before the dreamers. Darkness and ravenous monsters await. Who will survive the depths? Episode 6: The dreamers surface in Ulthar, a city of relative peace. However, two immortal enemies await the dreamers. Episode 7: The quest ends as it begins, in a restaurant in New York City. After all of this, can the dreamers reclaim their normal lives? Campaign Post-Mortem: An episode discussing the campaign between the GM and players.